WASHINGTON – As the world’s population grows and the amount and sources of potable water shrink, the number of conflicts over water access and usage is likely to increase, said members of a panel on water rights that convened Jan. 6 in Washington. But the opportunities to resolve those conflicts peacefully and sustainably can likewise grow, the panelists said. The forum, co-sponsored by Catholic Relief Services and the Woodrow Wilson International Center for Scholars, highlighted a new CRS publication, “Water and Conflict: Incorporating Peacebuilding into Water Development,” written by current and former CRS staffers. Part of the solution is practical. 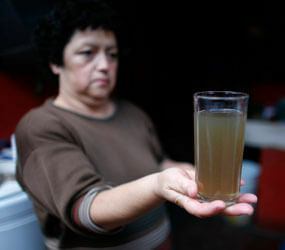 In El Alto, residents installed their own water system. “I can’t tell you how excited I was to get those tanks running and see the water flowing,” Gehrig said. But part of the solution is “not so much what we accomplished, but how we accomplished it,” he added. CRS director Ken Hackett said he once worked for the Peace Corps digging wells in Ghana. “Where to put the wells is a passionate item – especially for the women who have to fetch the water,” he said. William Hall, an adjunct professor in the conflict resolution studies program at Georgetown University in Washington, served with the Peace Corps, too, in Zaire (now Congo). “I remember well the women and children walking up tall hills to get water. And me capturing water from the roof with a 55-gallon drum and using it for bathing water,” he said at the symposium. Hall suggested using environmental conflict resolution to mediate among parties before a crisis erupts into something bigger and harder to contain, adding that it has shown success in 61 percent to 91 percent of the disputes where it has been applied – not only for water but other environmental issues as well. “Water is similar to a lot of other goods and services, like health. It is seen as a basic need. It is seen as a basic want, a human desire,” said Tjip Walker, a warning and analysis team leader in the U.S. Agency for International Development’s office of conflict management and mitigation. “Where conflict is most severe, the governance is the weakest,” Walker said, adding that solutions may have to depend on local rather than federal enforcement.